As many as one in four children through the age of five are at risk for a developmental delay or disability. Early identification allows communities to intervene earlier, leading to more effective and fiscally efficient treatment during the preschool years, rather than expensive special education services in later childhood. The programs that receive funding in this priority area work to increase the number of children 0-5 who are screened for developmental, social/emotional, behavioral, and cognitive delays; connect families to needed services; and identify and address barriers to accessing services. Expanding access to developmental screening for children 0-5, as well as screenings for maternal wellness, mental health, home safety, and basic needs. A call center that offers developmental screenings and information about available community resources. Training for child health care and education providers about child development, mental health, and the importance of early detection and intervention. Ongoing data collection and analysis to help identify gaps in, and barriers to, the system. 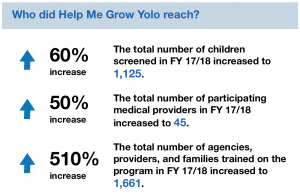 First 5 Yolo launched Help Me Grow Yolo in 2015 as a systems approach to improve early childhood mental health. First 5 Yolo is now leveraging funding with County of Yolo Health and Human Services Administration to partner on the expansion and enhancement of the program with a Mental Health Services Act (MHSA) grant. Thank you to our colleagues at First 5 LA!